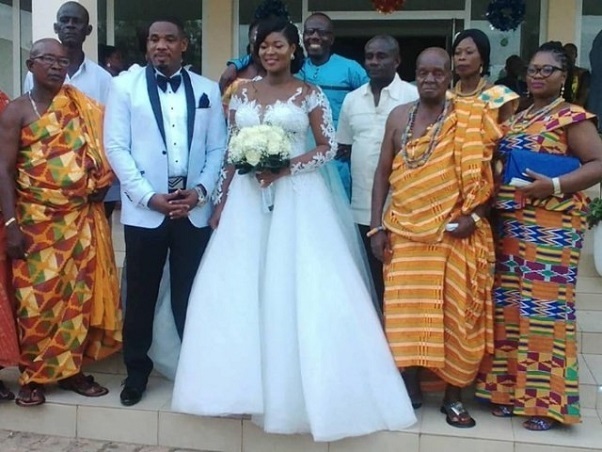 Betty Pretty Naadu Lartey, a lady whose sister is married to one Daniel has angrily hit social media platform, Facebook to call out the brother-in-law for marrying another woman. Betty claims Daniel is legally married to her sister since 2011 and has been staying with the wife in the United States. 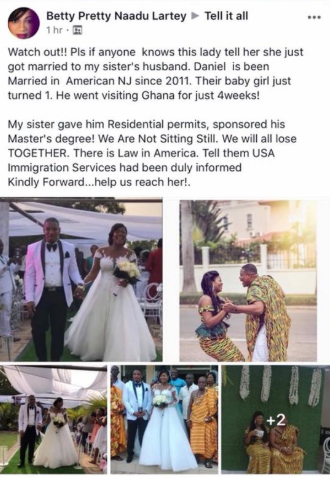 She mentioned in her post that Daniel told his wife he was going to vacation in his country, Ghana only for her [Betty] to see photographs from a wedding ceremony between Daniel and another lady in circulation. Tagging him as an ingrate and a deceitful person, Betty said her sister was the one who helped Daniel get a residential permit in the US. Not only that. She sponsored his master’s degree education. To back her claims with ‘evidence’, Betty shared pictures of Daniel’s wedding with her sister and called on anyone who may know the new wife to inform her in that regard.